pen and ink and coloured pencils, 9" x 12"
On Sunday 23rd August I drove up the M11 to Cambridge to join the Urban Sketching Cambridge Group ( also at https://www.facebook.com/uskcambridge) which is based there. 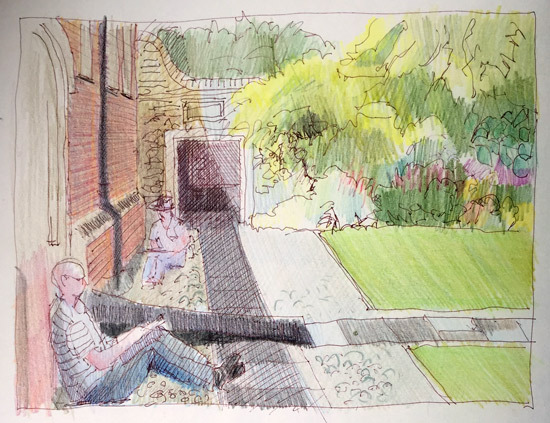 They had got permission to sketch inside Magdalene College. For some reason I spent all my student years in Cambridge without ever knowing anybody in the east part of the college so this was a novel experience for me. 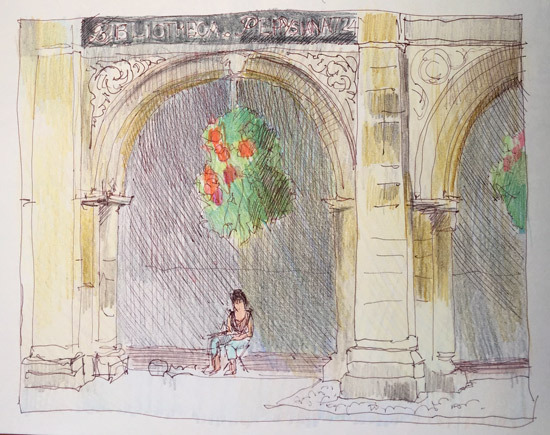 They were planning on a couple of hours sketching before lunch - and I wanted to see the Watercolour exhibition at the Fitzwilliam in the afternoon so I needed to be speedy! I decided to focus on just doing pen and ink sketches and then adding colour when I got back home. 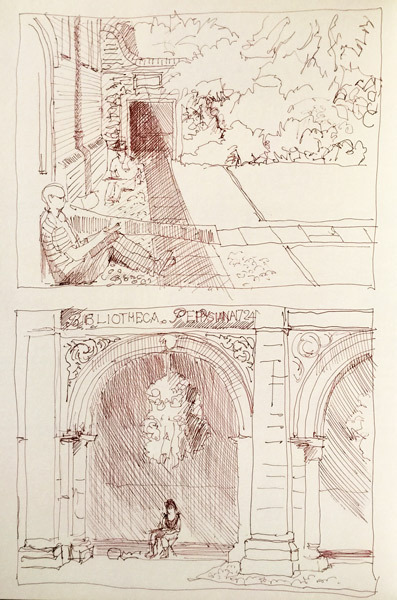 I started by sitting in the corners of one of the courtyards of Magdalene College and sketched the sketchers. Next are the two sketches above completed with colour - using coloured pencils - when I got home. I'm not sure who I've sketched in #2 below! 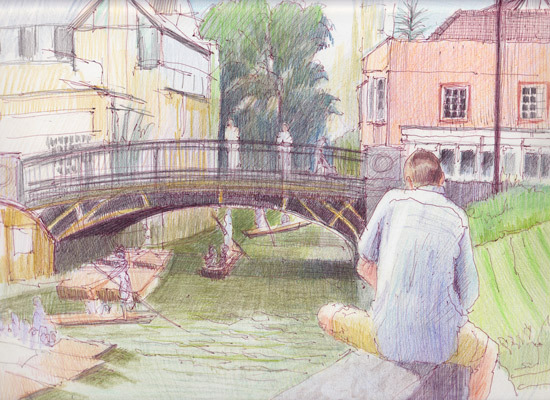 I then moved around the river side of the college and drew from the wall which separates it from the River Cam and the extremely busy Scudamore Punt station. I listened to lots of different punter guides explaining the college and the bridge and Cambridge generally to those on guided tours while sat in a large punt. I also watched a few novice punters receiving their instruction on what to do when taking out a punt for the first time. If I'd had more time I'd have loved to have drawn the comings and goings of the punters beneath me - especially the bit where those who knew the rules came up against those who didn't! "Oooh, that's changed!" (e.g. The Copper Kettle looks completely different and whatever happened to Eaden Lilley who did my graduation photo?). 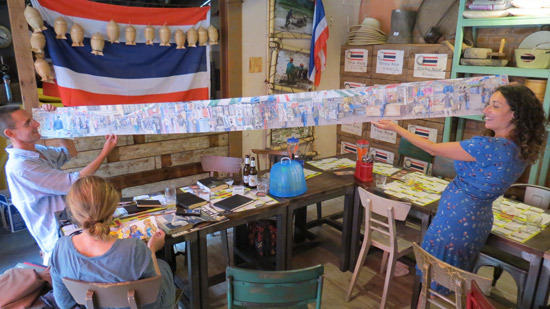 Have you ever tried this with a sketch?